Camp Invention Coming to Morris Grade School! 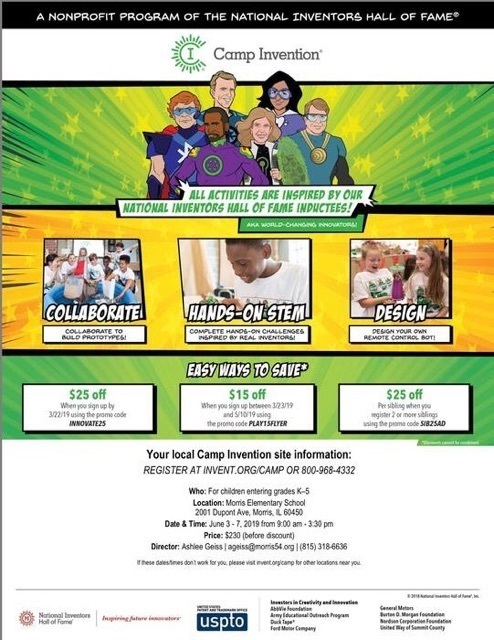 Camp Invention is coming to Morris Grade School the week of June 3-7, 2019! Register using promo code INNOVATE25L to save $25 (expires 3/22) or PLAY15LISTING to save $15 (expires 5/10) OFF $230. Every registration includes a complimentary Camp Invention t-shirt. Availability is limited, so visit www.invent.org/camp or call 800-968-4332 to secure your child’s spot today! Copyright © Morris Elementary School District #54 2019. All rights reserved.